One of my clients today asked me about the market for homes similar to this home, so it got me to thinking about Palos Verdes Home Values in the last 10 years for “modest” Palos Verdes Estates homes. 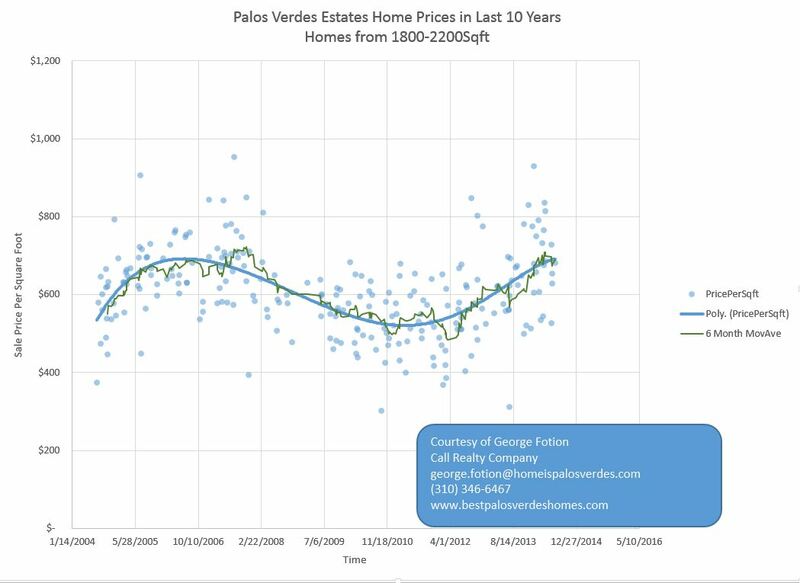 Look at the chart below for Palos Verdes Home Values. Would you be interested in learning more about Palos Verdes homes with living area in the 1800-2200sqft range? Palos Verdes Estates represents one of the several upscale towns in the Palos Verdes Peninsula real estate market. Palos Verdes Estates showcases master-planning in every level of its development. Palos Verdes Estates homes and exclusive neighborhoods render superb definition in exemplary architecture and landscaping. Palos Verdes homes for sale emerge in a scenic location near where certain beaches and steep cliffs meet the ocean. Available Palos Verdes Estates homes also rub shoulders with the distinctive, centrally located Palos Verdes Golf Club and Palos Verdes Tennis Club. These private clubs offers residents and guests a challenging golf or tennis experience with appealing club amenities. Palos Verdes Estates homes offers home buyers more than a glimpse into exclusive amenities and gracious living in elegant upscale homes. Palos Verdes Estates offers numerous luxury homes, some on acre plus lots with notable surf riding beaches intermingled in the landscape. Palos Verdes Estates homes for sale come in a variety of styles and floor plans, many of which are Mediterranean or Spanish. Palos Verdes Estates Homes for sale fetch a high-end price for their stunning accommodations and premier location, and start at around $1 million. Find out more about Palos Verdes Estates real estate and the community. Get details on Palos Verdes homes for sale, luxury homes, including estates astride the coastline and premier neighborhood amenities. Find what you need with my real estate and lifestyle map search and expert real estate services.